BRADENTON – Most of the men who walk through the doorway of the old house are just relieved to have a place to stay. They share a single bathroom, living room and small kitchen and pile into bunk beds at the end of a day spent working or looking for work, activities they’ve had little practice with for years. A new development center for Jim Russo Prison Ministries will replace an old house, pictured in the background, that the ministry has outgrown. Photos by Susan Green. Laura Russo stands in front of the new Russo Ministries center that is receiving finishing touches inside. A spacious new kitchen and eating area with all new appliances are among the improvements offered by the new development center getting ready to open at Jim Russo Prison Ministries in Bradenton. The house is nothing fancy, and Chris is OK with that. After three years in prison, he applied for shelter from five different organizations that help former inmates get back on their feet. Only Jim Russo Prison Ministries said yes. Even so, he’s excited that he and other former prison inmates will soon be moving into spanking-new digs, complete with two spacious common areas, a roomy kitchen with a pantry the size of a den, and five bedrooms, each with an adjoining bathroom. 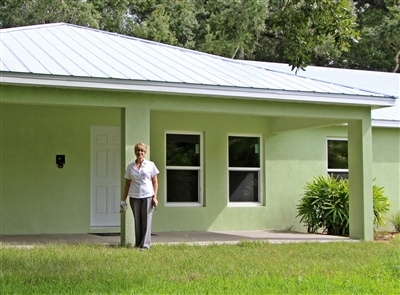 The ministry’s new $400,000 residential and development center was funded mostly through a federal Community Development Block Grant administered by Manatee County, but $50,000 came from the Florida United Methodist Foundation to meet grant requirements, said Laura Russo, daughter of the ministry’s founder, the late Rev. Jim Russo. The men are hoping to move in by next week. A formal dedication is scheduled for 11 a.m. Saturday, Nov. 1. Laura Russo and her daughter, Nicole Mattox, are carrying on the legacy. Laura, who remembers visiting her father in prison when she was a child, said she wants to extend the same kind of support the church provided to the Russo family. “I think about my dad and what would have happened to our family if my dad didn’t have a family and a faith-based family,” she said. When inmates are released, the state provides a bus ticket to a Florida destination for those without transportation, Laura said. Men accepted to Russo Ministries typically need not only a place to stay but help with local transportation, re-establishing government identification to be employable, acquiring new job skills and dealing with substance abuse issues. Five men are housed at the site this month, with four more expected by the end of October. The new center will allow 16 to 20 men to seek shelter and assistance, Laura said. For the first time, there will be space for a media center equipped with computers. To donate to this ministry through the Florida Conference, send payment to the Florida Conference Treasurer, 450 Martin Luther King Jr. Ave., Lakeland, FL 33815 and write Advance #510003 in the memo line of the check. The 14-month structured program includes Bible study, church attendance, and Alcoholic/Narcotics Anonymous and house meetings to foster fellowship and social skills. After an initial 30-day period to get their bearings, the men are expected to seek employment and start saving money so they can find housing when the program ends. The program not only helps former inmates overcome the stigma of a prison record but also internal issues lingering from their incarceration, such as loss of dignity, she added. Experts say the first three months after release are critical to keeping former inmates from stepping back on the path to prison. Laura said Russo Ministries usually discourages men from the Bradenton area from returning there because family or social influences may lead them back to their old ways. For many, breaking ties or at least distancing themselves from their old lives is key to building new ones, experts say. Those accepted to the program must fill out an application and write a statement. Russo staff members then talk with the prison chaplain and conduct a background check before accepting anyone to the program. 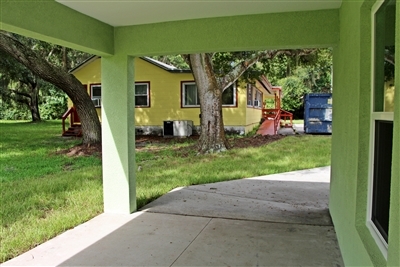 The tree-shaded Russo property is within walking distance of downtown Bradenton and offers easy access to bus service, Laura said. Her father acquired the site in 1980 with the help of a connection in United Methodist Men, which has long supported the ministry. Someone donated the house, and her father had it moved to the property by tractor-trailer. The center has been accepting inmates since 1986. Bible-based guidance and prayer will continue to be a part of Jim Russo Prison Ministries, founded in 1976 by a former prison inmate who was later ordained in the Florida Conference. Rev. Bob Green, pastor of Oneco UMC and a longtime board member of the ministry, said Russo operated out of downtown Bradenton even before that. His church and other congregations, including St. James UMC, Sarasota, support the ministry, which includes providing toys to prison inmates at Christmas so that they have gifts for their children during holiday visits. Local churches also collect nonperishable food to supply the men with nutritious meals as they try to rebuild their lives. The ministry’s founder was known for his ability to connect with people, said Green, who attended classes with Russo at Emory University. 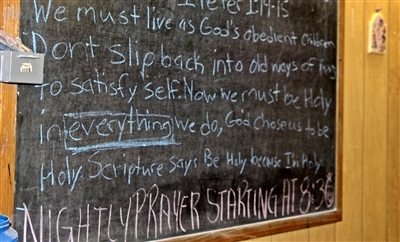 That’s a characteristic of the ministry that carries on, said Chris and another Russo resident, Jeremy Walton. For Walton, 40, a self-described drug addict from Polk County who said he served six years for bank robbery, the ministry has offered the ideal place to play out a commitment he made while still behind bars. The date of that commitment is etched in his mind – Jan. 25, 2013 – the day he was ambushed by four other inmates in a knife fight. He received serious head injuries and is convinced he escaped death. He has been at Russo Ministries for six months and has taken a leadership role with the group. He has a job paying more than $500 a week and is making plans to go to trade school to get a better one. Walton gives a lot of credit to Russo Ministries.